Whole world is discussing the pre launching of Apple I phone-6 Gold. People are awaiting the new version of much talked about phone. 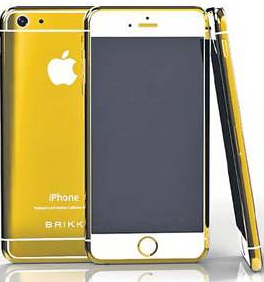 The well known luxurious accessories maker company, Brikk has commenced booking of iPhone6- Gold even before the launching announcement of Apple’s CEO Tim Cook. Brikk will send the iPhone6-Gold to the booked customers after the launch of the new model. The company will issue an upgraded version of the new model. The logo of Apple iPhone-6 Gold is gold plated with diamonds studded. The approximate price is slated to be US $ 4600. The upgraded model will touch US$ 8600. The pre-booking amount is US $500. Brikk has said that the delivery of the phone will be in a metal box. One-year warranty will be issued with test certificate of the diamonds affixed. 2)World War-I Memorial in Bristol, England. Bristol, located on the western coast of England is getting famous for its unity moves these days. One hundred years after their supreme sacrifice, erecting a war memorial in memories for the 48 heroes who sacrificed their lives for fighting against the enemies the world War 1. These days, effort of the citizens is under discussion and a favorite topic in Europe. The people of Bristol, through the social media decided to make this memorial befitting the occasion. 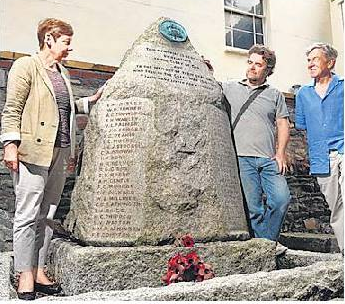 They have inscribed the names of the heroes of the Bristol on a granite stone. The previous memorial was built near St. Xavier Church in the park. The site became a waste, as nobody took its care. Hopefully, the new place will please everybody for times to come.